and from specialist book and hobby shops worldwide. 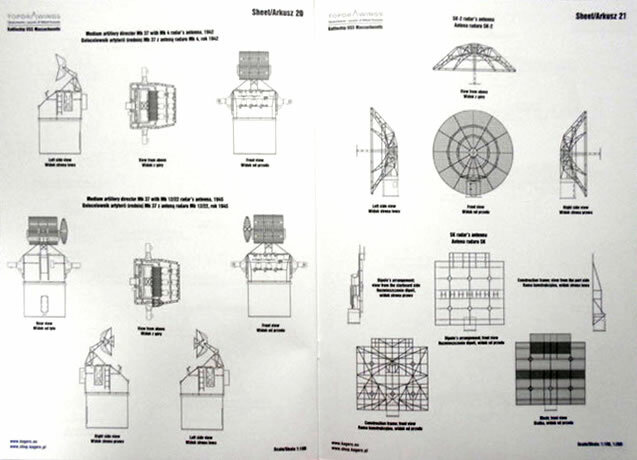 Well-produced set of drawings that will help a modeller enhance his or her model. Only the nomenclature, and the issue that the scales do not match either of the readily available kits. 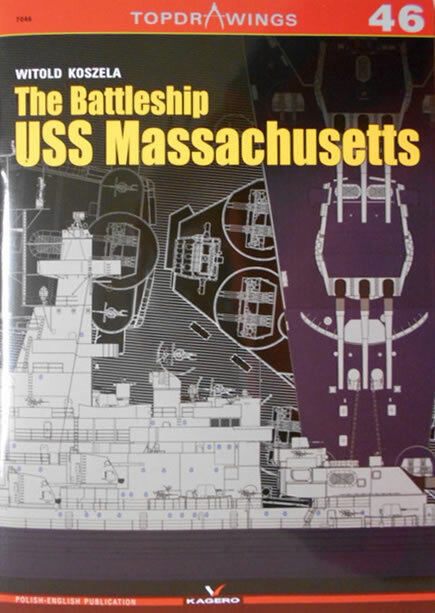 I can but recommend this volume to the ship modeller interested in this vessel as it gives detailed look at her component parts as well as the overall appearance. Certainly useful if you have either of the Trumpeter kits. A well-known battleship of the South Dakota class and affectionately known as “Big Mamie”, the USS Massachusetts served from 1942 until 1947 and was engaged in several significant actions connected with the invasion of north Africa, the damaging/destruction of several Vichy French vessels as well as action in the Pacific including shelling of the Japanese islands. Between 1947 and 1962 she was held in the Atlantic Reserve fleet in Norfolk before being put on perpetual display in 1965 in Battleship Cove along with a number of other significant warships. She is open for public visits. One of her claims to fame is that she fired the first and the last 16-inch shells used in WWII. 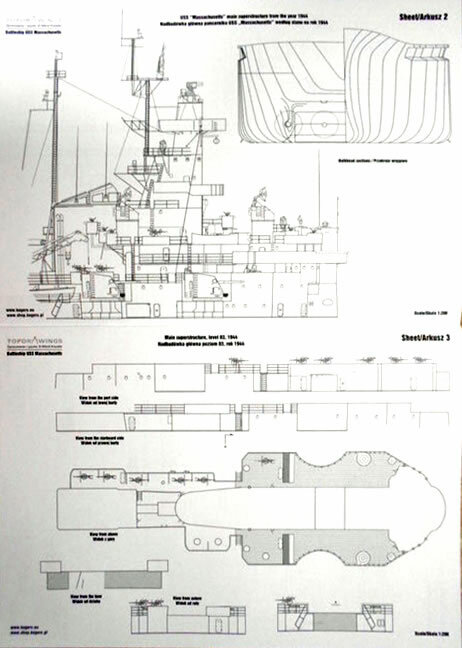 The book begins with a brief history of the vessel and includes a table of her dimensions and armament. Then begins a monumental collection of drawings over 25 A4 pages in a variety of scales, primarily 1/200 and 1/400, with some details drawn to 1/100 and two ship-borne aircraft (a Kingfisher and Curtiss Seahawk) in 1/72. In addition there are two foldout A3 sheets with full plan and elevation in 1/400, both outline and in colour. 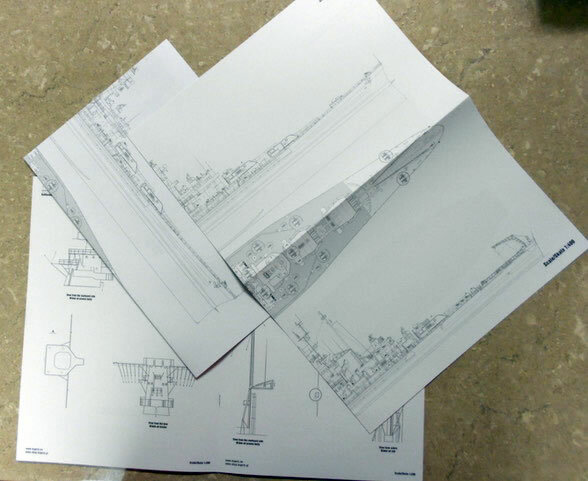 Many of the drawings are of different deck levels in 1944 and will be valuable to the modeller whether they be building the 1/700 or the 1/350 Trumpeter rendition, or even Revell’s old 1/720 rendition. Some re-sizing will obviously be required and I question the choice of drawing scale based on this point, although 1/350 would not fit on an A3 sheet. There is some initial text in Polish and English and drawings have captions in both languages. All drawings are very sharp and give a lot of detail of fittings and shapes, especially of the armament, cranes and the radar fitment. Drawings all appear to refer to the vessel as she appeared in 1944. While I have not built a ship since the Airfix HMS Hood in 1966 I still like looking and admiring such models and the drawings for them. There is a lovely scratch-build of this vessel in wood and metals on the site modelshipmaster.com for those of you who are interested. The literal Polish to English translation does raise one tiny issue of nomenclature. Side views are called “View from port or starboard side” rather than the more correct “Port or Starboard Elevation” and similarly all top views are called “View from above” rather than “Plan View” but that is the school teacher pedant in me rising to the surface! Thanks to Casemate Publishing for the sample.